There are at least 200 billion stars in our galaxy, and perhaps even a greater number of planets. Now a new study suggests there could be an additional 50 billion rogue planets, not orbiting any stars. Artist’s concept of rogue planet CFBDSIR J214947.2-040308.9. Image via ESO/L. Calçada/P. Delorme/Nick Risinger (skysurvey.org)/R. Saito/VVV Consortium. Based on findings from space- and ground-based telescopes in recent years, astronomers now estimate there are billions of exoplanets – planets orbiting distant stars – in our galaxy alone. But what about planets that don’t orbit stars? How many rogue, or free-floating planets wander the depths of space unbound? Some have already been found, and earlier this year astronomers at the University of Leiden in the Netherlands announced results of their new study, suggesting there are some 50 billion free-floating planets in our Milky Way galaxy. 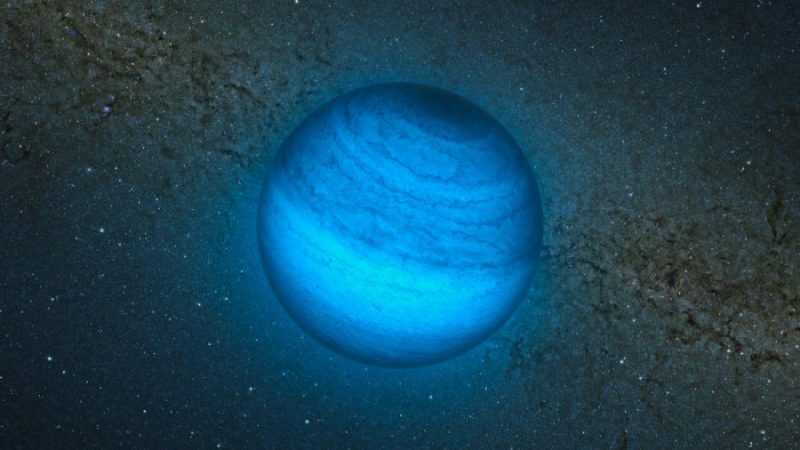 Only a dozen or so rogue planets have been discovered. How did these astronomers’ research determine there might be 50 billion more? They ran computer simulations of 1,500 stars in the Trapezium star cluster, a well-known region of star formation located some 1,300 light-years away in the Orion Nebula, in the direction of our constellation Orion. 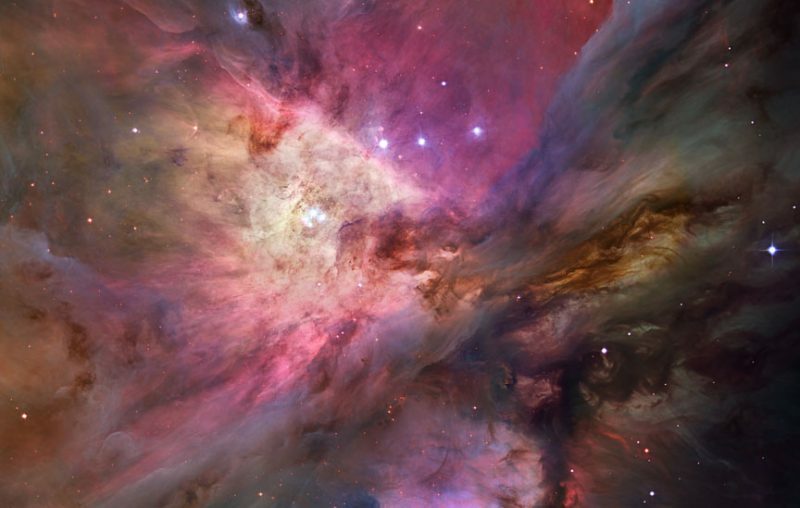 View of the Orion Nebula – a well-known region of star formation – via the Hubble Space Telescope. The Trapezium star cluster is the bright area just left of center. It contains about 2,000 known stars, but there may be more as well. It is a young open cluster where the stars are all roughly the same age. Image via NASA/ESA/Hubble Space Telescope. So 281 of 2,522 newly born planets would leave their original star-forming cluster altogether, to roam the space between stars and star clusters, according to this computer simulation. The researchers then extrapolated those numbers to the rest of the galaxy, based on estimates of 200 billion stars in our galaxy. After all, the Trapezium star cluster is just one of thousands of known star clusters. 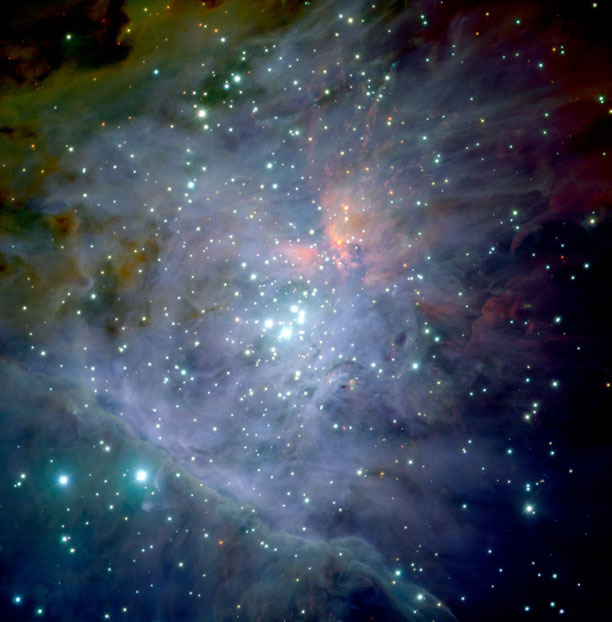 All of the Milky Way’s stars are thought to have originated in vast star-forming clouds like those in the Orion Nebula, and to have started life in star clusters much like the Trapezium star cluster. If, as calculated, about a quarter of the Milky Way’s stars have lost one or more planets, as many as 50 billion planets should be rogue or free-floating, in our galaxy alone! Bound exoplanets likely outnumber stars in the galaxy; our single sun has eight major planets, and we’ve now seen thousands of planets orbiting single stars in multiple-planet systems. The estimates for the total numbers of planets in our Milky Way – both bound to stars, and rogue – is staggering. Just a few decades ago, it wasn’t yet known if any exoplanets existed. Now, current observations suggest there are hundreds of billions. Combine that with the billions of galaxies, and the implications are mind-blowing. Closer view of the Trapezium star cluster in the Orion Nebula (bright stars near center of photo). Image via ESO/M.McCaughrean et al. (AIP). 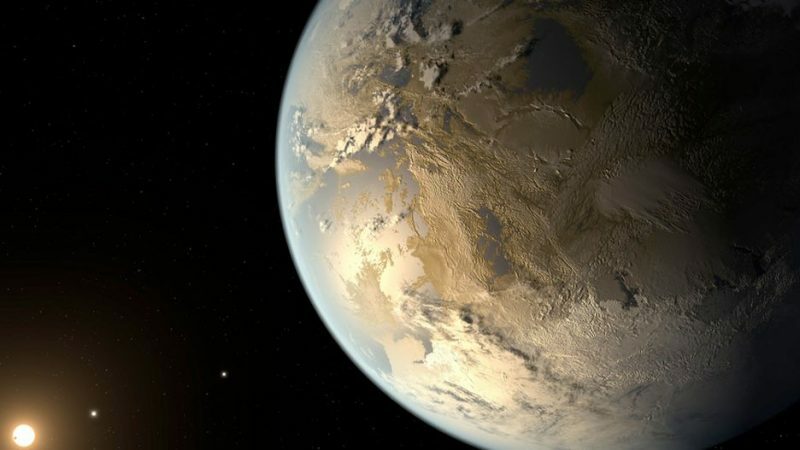 Artist’s concept of exoplanet Kepler-186f. Most exoplanets – as might be assumed – orbit their own stars, but there may be billions more in our galaxy alone that do not. NASA/JPL-Caltech/T. Pyle. The ejection of planets from their home planetary systems might be more common in denser star clusters (the Trapezium star cluster is considered a “looser” cluster), since more frequent encounters between stars in dense clusters will make the planetary systems unstable. But the study of the Trapezium cluster shows that planets leave their home systems in looser clusters as well. Two of the dozen or so confirmed rogue planets so far were announced last year – OGLE-2012-BLG-1323 and OGLE-2017-BLG-0560. The first is estimated to have a mass between Earth and Neptune, while the other has a mass between Jupiter and a brown dwarf star. Rogue planets are not easy to detect, but as astronomers learn more about them, they’ll be able to find more in the coming years. If this new study is any indication, there are many of them awaiting discovery. Bottom line: The existence of 200 billion stars in our galaxy – and an even greater number of planets – is difficult enough to wrap our minds around. The idea of another 50 billion planets just floating around, not bound to any stars, is even more incredible. It might sound like science fiction, but, if astronomers at the University of Leiden in the Netherlands are right, these 50 billion rogue planets do exist. Universiteit Leiden was founded in 1575 and is one of Europe’s leading international research universities. It has seven faculties in the arts, sciences and social sciences, spread over locations in Leiden and The Hague. The University has over 6,500 staff members and 26,900 students. The motto of the University is ‘Praesidium Libertatis’ – Bastion of Freedom. 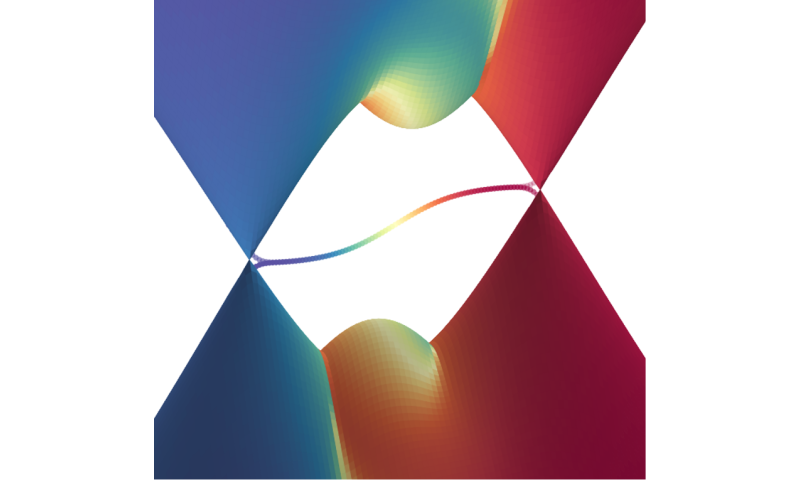 Theoretical physicists have found Weyl fermions to exhibit paradoxical behavior in contradiction to a 30-year-old fundamental theory of electromagnetism. The discovery has possible applications in spintronics. The study has been published in Physical Review Letters. Physicists divide the world of elementary particles into two groups. On one side are force-carrying bosons, and on the other there are so-called fermions. The latter group comes in three different flavors. Dirac fermions are the most famous, comprising all matter. Physicists recently discovered Majorana fermions, which might form the basis of future quantum computers. Lastly, Weyl fermions exhibit weird behavior in, for example, electromagnets, which has sparked the interest of Prof. Carlo Beenakker’s theoretical physics group. Conventional electromagnets work on the interplay between electrical currents and magnetic fields. Inside a dynamo, a rotating magnet generates electricity, and vice versa: Moving electrical charges in a wire wrapped around a metal bar will induce a magnetic field. Paradoxically, an electric current produced within the bar in the same direction would produce a magnetic field around it, in turn generating a current in the opposite direction, and the whole system would collapse. Oddly enough, Beenakker and his group have found cases where this does actually happen. Following an idea from collaborator Prof. İnanç Adagideli (Sabanci University), Ph.D. student Thomas O’Brien built a computer simulation showing that materials harboring Weyl fermions actually exhibit this weird behavior. This has been observed before, but only at artificially short timescales, when the system didn’t get time to correct for the anomaly. The Leiden/Sabanci collaboration showed that in special circumstances—at temperatures close to absolute zero when materials become superconducting—the strange scenario occurs indefinitely.